If you’re anything like me, even though you try to be really good with your budget, you might have kind of blown it last month. If you’re looking at the first of year and getting your budget and finances back on track you’re going to love today’s episode! Because let’s face it, we could all stand to do a little bit better with our finances, am I right? We have a special guest today, Ruth from LivingWellSpendingLess.com I ran into Ruth online about a year and a half ago. 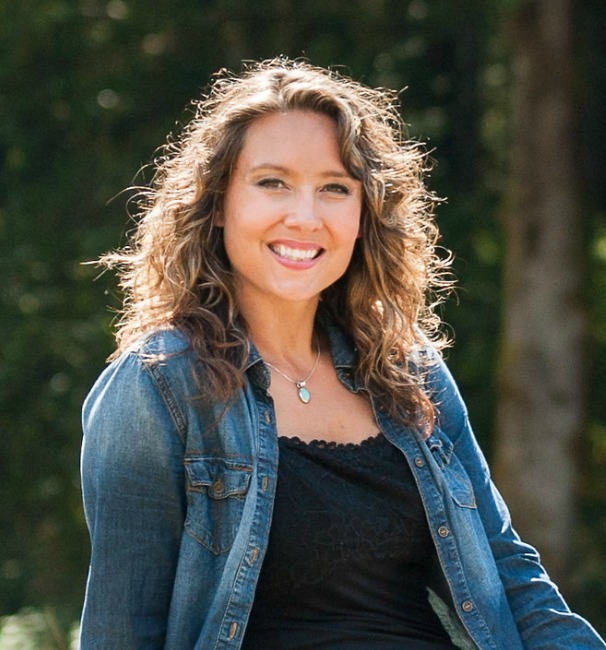 I found her on Pinterest and followed through for recipes, frugal living tips, but what really drew me in was her Amazing Grace story on her journey through depression and how God brought her out the other side. 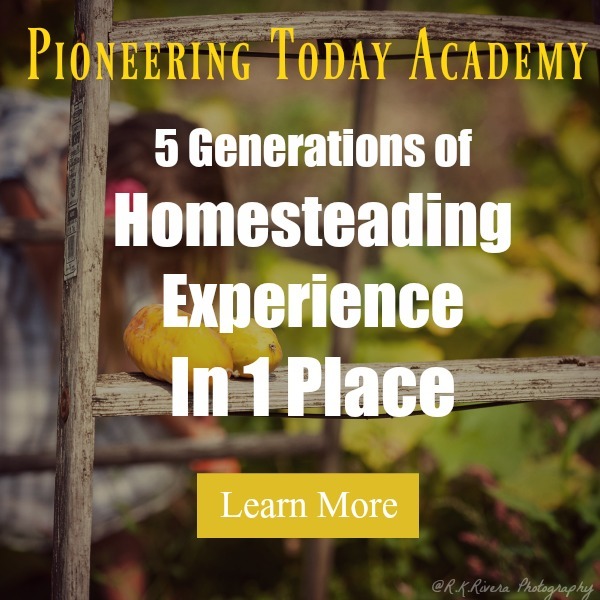 Her tips on frugal brought me, but her personal story of what God has done in her life and touched me and made me stick around. 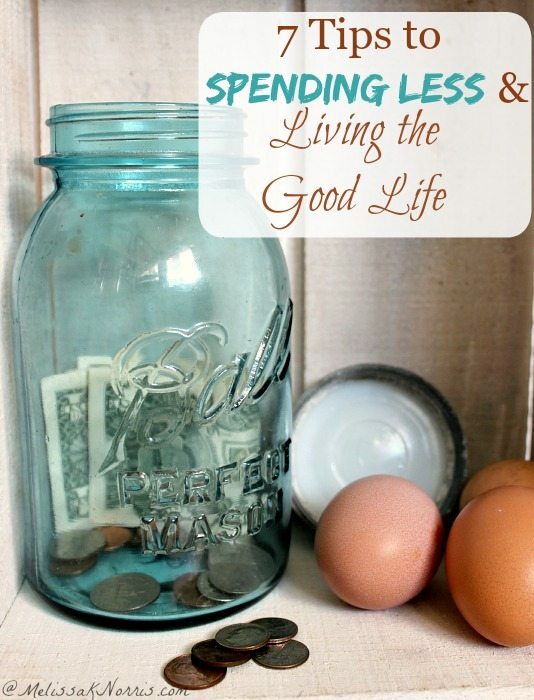 What does living well spending less really mean? 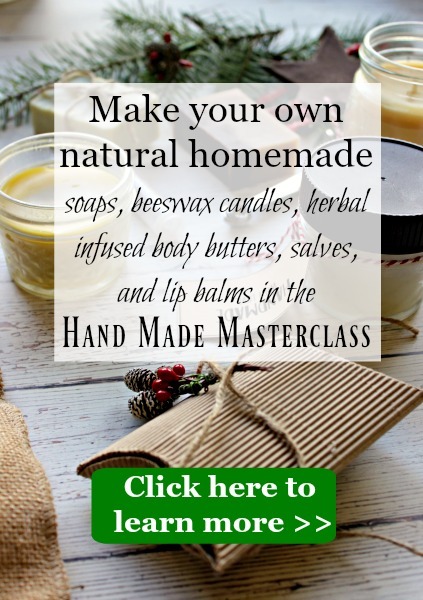 Ruth: I first started the blog in 2010 with not the noblest of purposes. I was spending too much money and shopping too much. And my husband and I were fighting a lot about money. I needed a way to hold myself accountable and we’d agreed to go on a tighter budget. I started it to figure out a way to get all the stuff I still wanted without as paying as much for it. I started using coupons because I figured the less I spent on food the more I could spend on shoes. It just kind of grew out of there. But God works in mysterious ways and it was through my blog as I started writing about ways of living well on a budget and trying to really work to really stretchy my dollars I realized there was really a lot of stuff I didn’t need or want in my life. I was pursuing the wrong things. I went through this journey very publicly and realized the good life to me is not a life filled with stuff but a life filled with family, friends, faith, hospitality and creativity. Those are thing most important to me. As I prayed for God to change my heart he really answered that prayer and I found so much more contentment in living well on less and with less. That doesn’t mean I don’t spend money or that everything is frugal this or frugal that. It means I’m much more intentional in the way I spend my money and I’m seeking something that is not so much what we have but who we are. I’m like you I like to finagle a way to save in one area to spend in another. And that’s very backwards. Ruth: What appeals to me and what appeals to you and someone else will all be different in terms of stuff. We all have a tendency to do this, people think they’re being very frugal with coupons, and are using them to buy things to fill a hole and void inside them, and my blog and my new book deals with, “What is this hole inside of we’re trying to fill with things instead of what will really fill us up?” And it’s different for everyone. Melissa: I got to read a preview of the book. 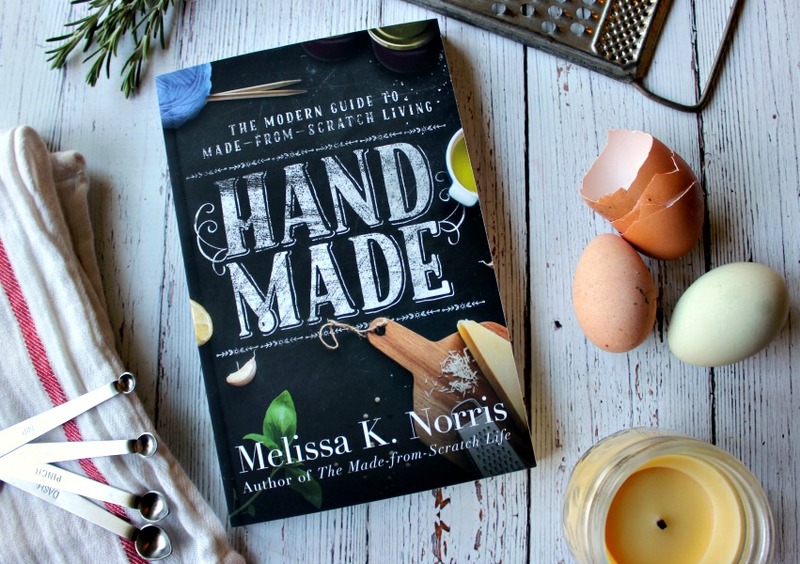 I was expecting when I first got into it kind of like a list with deeper explanations of being frugal and ways to spend money, but when I opened it and you started sharing your story of how God moved in your life I got really excited. When you shared your heart and how God had worked I loved it because at the end of the day and the end of our lives it comes down to what we’ve done with our life for God and what He’s done through us when we allow Him to work. It’s so fabulous to share these stories because my faith and life is enriched when someone shares their testimony on what God has done. I think it’s great you share that part with the hands on frugal part, it’s kind of married together. Ruth: It’s very much a little of both. 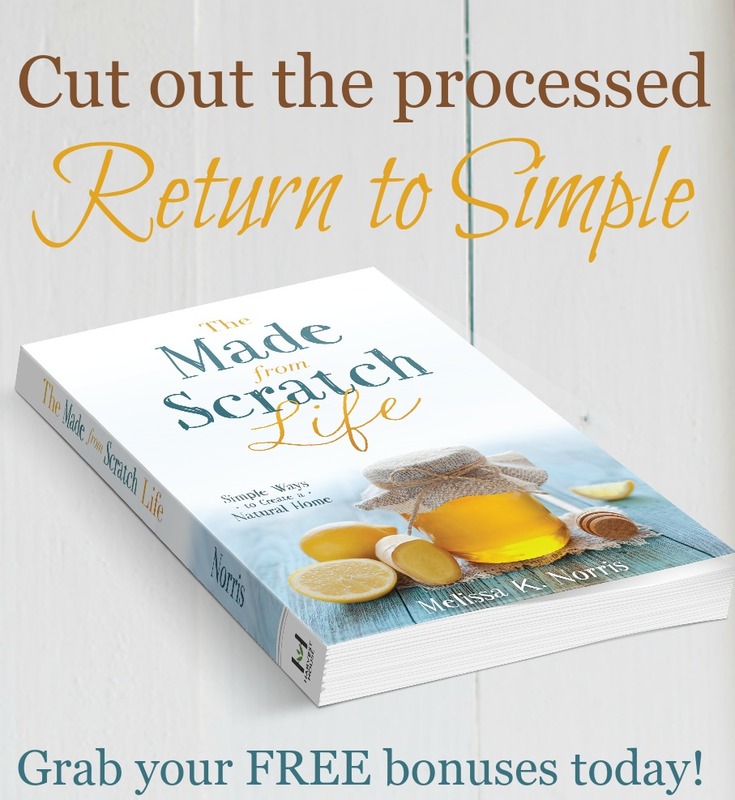 I offer a ton of practical tips in the book, between saving money on groceries and homemade cleaning products and setting up a budget, with codes for free printable downloads. It’s also very personal and real. I share a lot of really hard stuff from my own life and the lessons that I’ve learned. I talk about that in the first chapter. All the practical tips in the world will not change your life. I can’t change anyone’s life, I’m not the one who changes hearts, only God can do that. It only is going to come with prayer. I can just give you a few pointers to help make things easier along the way. Hopefully you will, it’s a heartfelt book. It’s a little scary to put yourself out there like that. But I’m excited to see God work through it. I feel I was called to write this book and share this story with people. Melissa: I was going to ask you if it’s scary. I’m in the midst of writing my book right now. I know the more honest and transparent we are about our struggles, because everybody struggles, the more we reach people. Because when people are real with me and say, “hey, this is what’s really going on,” instead of the pretty Pinterest picture that we like to show people. But it is scary, I’m writing and thinking I don’t know if I want to put this out here. Did you feel that way at all? Ruth: I had a lot of those moments. Writing this book really broke me in a way. There were days I was on my knees saying God I can’t do this, I’m not worthy. I know you called me but I don’t think I can do this, I don’t have anything to say. I can remember I was at a conference in Austin and going back to my hotel room. I collapsed on the floor and sobbed myself to sleep because I thought I couldn’t do this, I didn’t have it in me. I feel your pain. I think they wait so long between the writing and actually publishing the book. You’re so raw afterwards. You put your whole self out there and you want to pull back and recover. Then you put it out there for everyone to read. It’s one of the hardest things I’ve ever had to do. Melissa: I’m really relieved to hear that. Last night I was at the computer writing and crying, mascara running everywhere. Thank goodness the kids were in bed. I know not everyone is called to write a book, but we all have hard spots, and that’s when God is really growing me. The pain is almost a consolation. To know He’s going to use that to stretch me for His benefit and glory, and my own benefit. Ruth: I’m really glad you said that. I’ve been reading in Hebrews 12 over and over again. It says run the race God has set out before you and just like a Father disciplines His children because He loves you, and that’s how you grow. I keep reading that, I can do this, this is my race. It’s tough to put yourself out there. I think the broken process is completely normal and self-doubt comes in. It’s Satan coming in to make you question yourself, but know it’s what you’re supposed to be doing. Melissa: That’s good to hear. I want to talk to give people some concrete tips to get their budget back on track. I like to have one goal for the new year that I focus on and I think this is a great way to focus and jump start our year. What is the hardest thing about sticking to a budget? Ruth: The hardest thing is actually following through. It’s easier to stick to a budget when money is tight and you’re forced, too. The last couple of years have been good to us. My husband and I are in a situation where we’re debt free and don’t have a mortgage. Our expenses have gone way down and to have the discipline to still stick to a budget even when we could spend more is still difficult. I know that money isn’t my money and what I do with it really does matter. Just because I want it doesn’t really mean I need it. Understanding that difference between a want and a need, I don’t always do that perfectly, but that’s the biggest challenge. For other people really struggling to get by it’s knowing how to do the budget so it actually covers everything. It can still come down to needs and wants. Melissa: I think to a lot of times I’ll think I need something, but when I really examine it, it really is a want. I can cloak a want as a need, but it’s really a want. Some items can kind of straddle that. Ruth: We need so little. We need food and clothing. But most of us have far more cothes than we need, including food. When you’r really looking at want verses need you have to really examine it. Melissa: This summer we did a new thing for us. We do a large garden and have our own laying hens. We don’t have a dairy animal, but during the summer I tried to go to the store only once for the whole month. It’s easier in the summer with the garden. It was really interesting because I’d gotten into the habit of doing menu plans and picking what sounded good. When we committed to it, it was eye opening because I had to cook with what we had available to us. I had a ton of zucchini and one morning I wanted to bake bread. But I needed eggs to do it. I didn’t have enough and I went out to the coop. “If there’s not enough eggs I can’t make this.” I opened the door and there were just enough eggs to make the recipe. I thought, “This is what it means to really rely on God for our everyday needs.” I don’t really do that most of the time. It gave me a new way to look at how my cooking is even more actually wants than a need. I don’t want to struggle to the point we can’t put food on the table, but a lot of my grocery shopping is want instead of need. Ruth: We do that once or twice a year. We do a whole month of no spending and pantry challenge. We eat what’s on hand in our freezer and pantry. We don’t have chickens, so we go to the store for eggs, milk, and bread. It’s so good for us when we pair that with a spending freeze. It makes us take a step back and realize we already have so much more abundantly than we could ever ask for, want or need. It helps us take it in and appreciate what we have more. We usually do it in October and January. Melissa: That’s awesome, I’m glad I’m not the only one who does stuff like that. What’s your best tips for getting back on a budget if you’ve never been on one or need to get back to it? Ruth: A spending freeze is great. In the holiday’s we get in the habit of buying things. As a spender I get into a mode and it feels natural and good, and I’m buying them for other people. A freezing spend is a must for spenders. You have to go cold turkey and say I’m not going to spend anything this month, other than my bills that have to be paid. We don’t go out to eat or anything and do a reset. It’s the fastest way to get a budget back on track. Melissa: By a spending freeze you mean your mortgage and any set payment you make for the month you still pay, but nothing else? Ruth: Yes, you still have to pay your bills. But any non-necessity you don’t purchase. On my site I did a 31 day challenge on this and thousands of people do it every month. It gives you ideas on what to do every day that doesn’t spend money. Week 1 is meal planning and an inventory of your pantry. You get in the habit of going to the store and not knowing what you’ve got. Week 2 is cleaning your house from top to bottom. When my house is messy I want to leave the house and I’ll go to Target to buy organization things. You think if you buy the right bin or tool it will make your house better. But really getting to work and clean up is what does the job. Week 3 is creative ways to do things with the money your saving. Week 4 is how to make money so you have something extra. It’s like an emergency intervention. Melissa: You have a group of people who do the 31 day challenge or it’s a rolling thing? Ruth: I have a forum at LWSL it’s a $1 a month and you get a free month as well, and you can join and connect with other people who are doing the challenge. We typically have about 2 thousand people doing it every month. Melissa: Cooking from what you have is big. Do you have any other big budget tips? Ruth: If you have stuff you don’t need or got more stuff from the Holidays, go through and sell the extra stuff to get extra money. If you got a new television you should sell the old one to make money. Going through and inventorying and seeing what you can sell to raise money? Melissa: A lot of budgeting is about being frugal, but sometimes you’re already on so tight of a budget you can’t cut any more corners. So this gives people a way to bring extra money into the budget. That’s a great point on earning extra money to help out. Do you have any absolute best way to save money other than the spending freeze? Ruth: Telling your money where to go. It’s not just one thing for me. I used to use a lot of coupons, but I don’t anymore. I don’t do the grocery shopping now, my husband does. But we follow the same method. A lot of people think using coupons are saving them a lot of money, but they’re not. It’s key to know what a good price is and then stocking up on enough of that item until it comes back on sale again. We’re really careful of always buying when they’re on sale. My husband is great about doing and sticking to that. I think with budgeting it’s a matter of telling the money where to go, creating categories, and using cash. It’s harder to spend cash than it is to put it on a card. Melissa: It’s funny because I don’t really use coupons either. The things I buy doesn’t usually have coupons but I was raised frugally. When we went shopping we always went to the clearance. I still do that, but the bad thing is I’ll look at it and it’s 60% off the lowest marked price, that’s a huge savings. But a lot of times I buy it because it’s an awesome deal, not because I really need it. Ruth: Spending is not saving. Which means if you’re buying something you don’t need because it’s a great deal you’re not saving money on it. You’re often better off paying more for something really high quality than to just look for bargains just because they’re a bargain. Many of us are guilty of that, especially women with clothing. Melissa: I’ve had clearance rack issues before… If you had to pick one Bible verse that’s really ministering to you right now, what would it be? Ruth: It’s Hebrews 12:1 (NIV) Therefore, since we are surrounded by such a great cloud of witnesses, let us throw off everything that hinders and the sin that so easily entangles. And let us run with perseverance the race marked out for us. Running the race has God set before you and keeping your eyes fixed on Jesus. I reread the words every morning and keep my eye on Him. It’s easy to get distracted, but especially in the on-line world. We see what everyone else is doing so staying focused on where God is leading us in the race He has marked out for me. Melissa: I love that verse. I’ve read the Bible through, but there are certain time the Holy Spirit brings a verse out for us. I love those moments and I know He’s speaking to me at that time. I find someone will bring up a verse and it just hits you at that moment. It stays with you when you really need it. I love to hear those verses from others as well. Thank you for coming on the show today! Ruth: Thanks for having me! I have no problem chatting away. 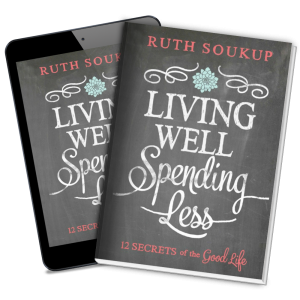 is Ruth’s book, Living Well Spending Less 12 Secrets of the Good Life. You can get it any book store, including Christian book stores. 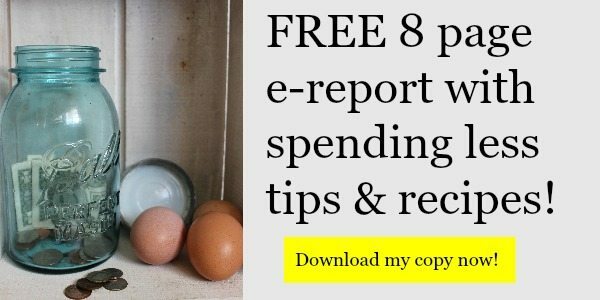 Get our 8 page e-guide on more spending less tips and frugal recipes FREE!